Wisteria plants have always attracted my attention, well before I was interested in photography, and well before I was interested in flowers. Probably because there are two monumental plants not far from home, along the path to the church, that I've been walking on for forty-five years. 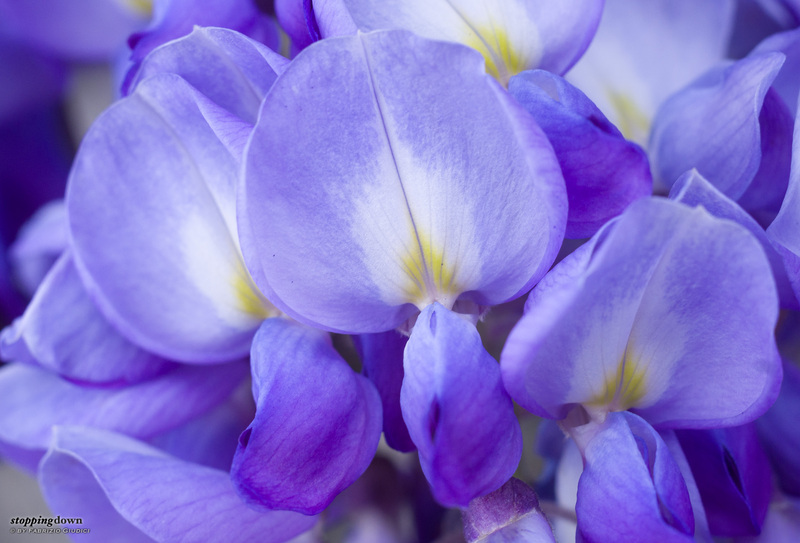 Wisterias are not particularly interesting for most of the year; but during Lent, all of a sudden, they blossom in an explosion of purple. A few days before, they only are a cluster of contorted branches, dark and deserted of life; then a few single purple spots appear; and after only a few days they reach the blossoming peak, in a feast of scent and buzzing bees. Paradoxically, I've never been able to take a photo of those two plants. Not only because the blossoming lasts for a short time, and sometimes I just don't have the opportunity, but because I don't know how to approach them. Around the world I've found other monumental wisteria plants that offered some hints, for instance because they were arranged as the roof of a patio or such. But the two plants near home “just” hang on a wall. They also are a few metres above any reachable point, so an intimate approach is not feasible. I think that even this year will go away with no news. 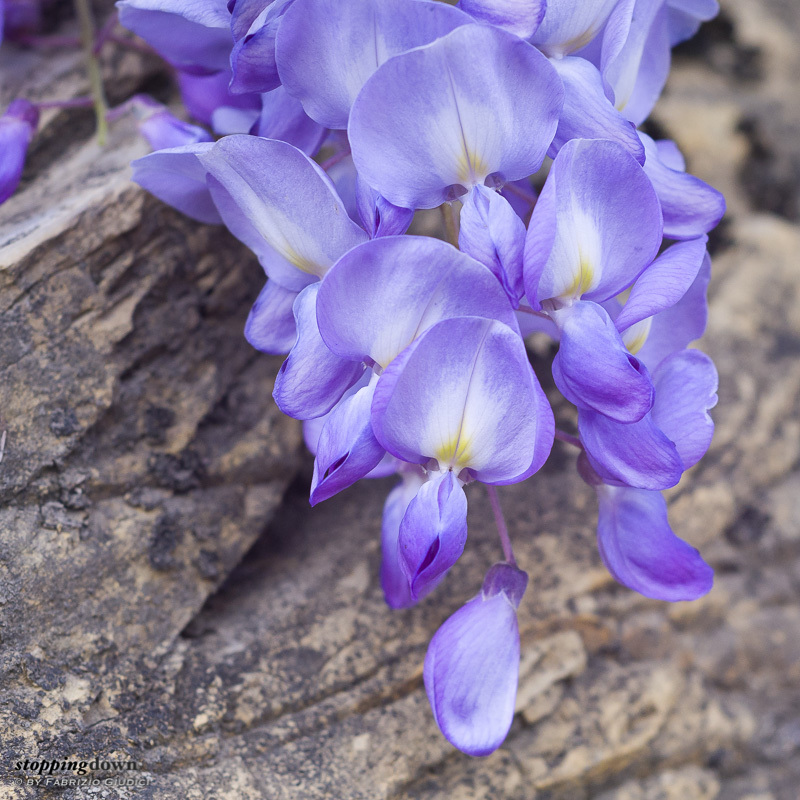 Fiori di glicine (Wisteria sinensis). Sony NEX-6 + Nikkor AF-D 50.0 mm f/1.8 @ 50 mm, 1/250 sec @ ƒ/5.6, +1.00 EV, ISO 400, focusing helicoid, hand-held. But there is plenty of wisteria plants around, and some offer their racemes to a close contact. This year, at last, I spent some time with them, and I was rewarded. Just as a starting point, paying attention to a single flower and its neighbours does make sense. They are often neglected in favour of the whole view, still they offer a delicate vein pattern and tonal gradients, from blue/purple to white, including a pale yellow core. Sony NEX-6 + Nikkor AF-D 50.0 mm f/1.8 @ 50 mm, 1/125 sec @ ƒ/8, +1.30 EV, ISO 400, focusing helicoid, hand-held. Sony NEX-6 + Nikkor AF-D 50.0 mm f/1.8 @ 50 mm, 1/250 sec @ ƒ/2.8, +1.30 EV, ISO 100, focusing helicoid, hand-held. Racemes are interesting also because they offer diverse patterns if observed at different stages; when blossoms aren't open yet, branches and branchlets can be seen, while they are totally hidden by flowers at their full expansion. Having the chance of working very close to a large portion of a plant, I was lucky enough to find two racemes at different stages of blossoming. 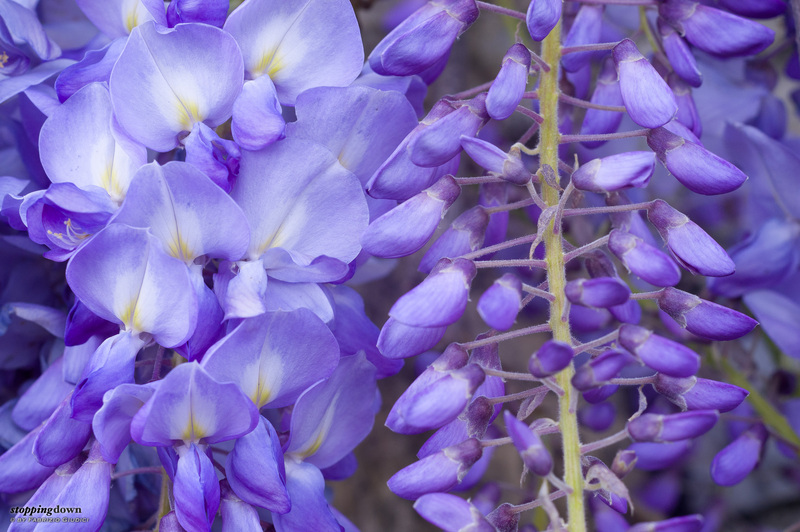 A diverse velocità (Wisteria sinensis). Sony NEX-6 + Nikkor AF-D 50.0 mm f/1.8 @ 50 mm, 1/125 sec @ ƒ/8, +1.00 EV, ISO 400, focusing helicoid, hand-held. 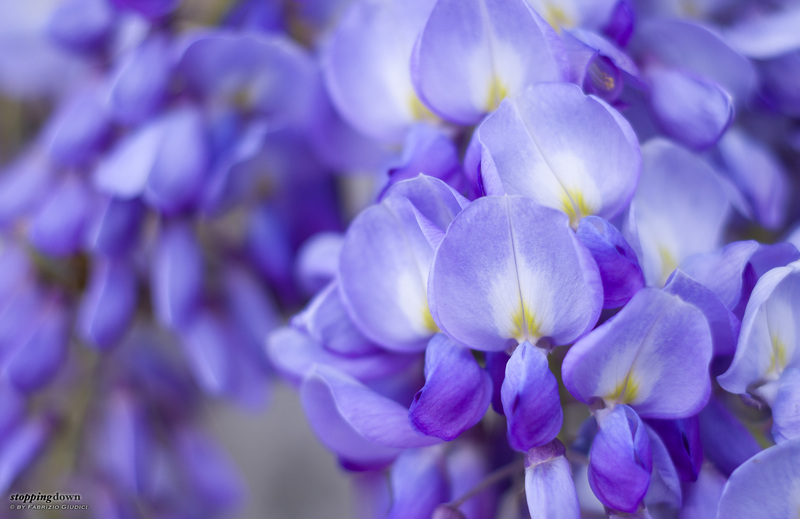 Being wisteria flowers not small and clustered together, and not having much sense to isolate a single one, I mostly worked quite stopped down, mostly ƒ/5.6 and ƒ/8. But my favorite shot of the session was taken almost wide open at ƒ/2. 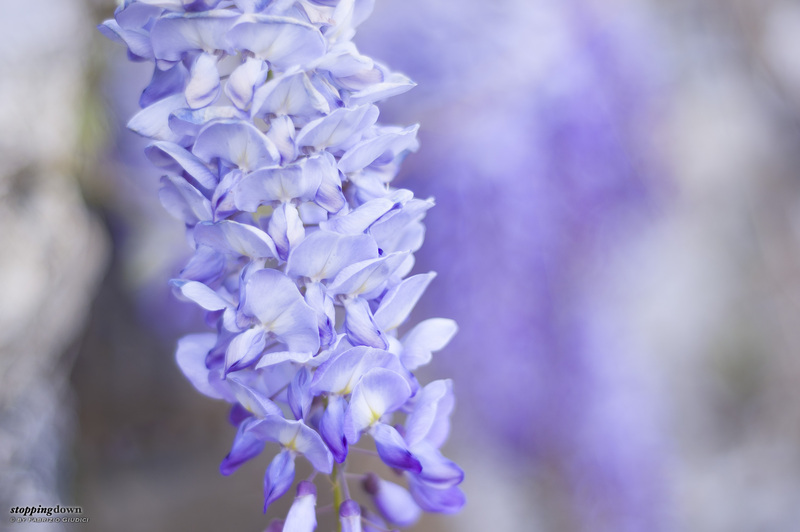 I concentrated on a single raceme, arranging the perspective so another provided a purple blurred background. I picked an overexposed version of the shot, which gave a non-realistic, kind of abstracted depiction of the subject. It was another good performance of the Nikkor 50mm ƒ/1.8D AF with the focusing helicoid adapter. Racemo di glicine fiorita (Wisteria sinensis). Sony NEX-6 + Nikkor AF-D 50.0 mm f/1.8 @ 50 mm, 1/400 sec @ ƒ/2, +1.70 EV, ISO 100, focusing helicoid, hand-held.